Saggital view of a human brain from an MRI (magnetic resonance image) to illustrate the location of the cerebellopontine angle. 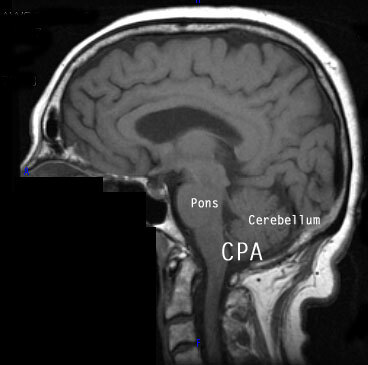 The cerebellopontine angle (CPA) is formed at the junction of the cerebellum, pons, and medulla. Arachnoid cysts constitute 1% of all intracranial space-occupying lesions. When they occur in and around the CPA, they can cause dizziness and imbalance as well as hearing symptoms. In the posterior fossa, subarachnoid cysts they typically produce vague, nonspecific symptoms. Presenting symptoms can include hearing loss, imbalance and tinnitus. A subset of these lesions can produce signs and symptoms indistinguishable from those of Meniere's disease. Contemporary diagnosis is presently based on neuroradiological tests. MRI scan commonly documents a structure outside of the main substance of the brain that contains spinal fluid. Often there may be a question whether or not the cyst is open or closed. If it is closed, it may put pressure on cranial nerves and other CNS structures. Cisternography can be performed to determine if the cyst communicates with spinal fluid or not. If it does, surgical management is not needed. Other types of cysts are relatively rare. Cystacercosis cysts arise from parasitic infections. They are generally smaller and occur in multiple locations. Neuroglial cysts are within the substance of the brain. They are not generally confused with subarachnoid cysts because of their location. Conventionally, nearly all subarachnoid cysts are considered "benign" and no active management is required. This idea may be incorrect as recent studies suggest that brain function is improved by removal of cysts, even in adults (Rader et al, 2005). There is no medication known to have a substantial effect on the growth of subarachnoid cysts. Occasional patients undergo surgical removal or puncture of the cyst. O'Reilly RC, Hallinan EK. Posterior fossa arachnoid cysts can mimic Meniere's disease. Am J Otolaryngol. 2003 Nov;24(6):420-5.